Take a closer look at how UPS is bringing the global smart logistics network to life. In 2017, UPS aligned its technology and engineering functions into one organization and named Juan Perez its Chief Information and Engineering Officer. Perez leads a team of UPS engineers and IT professionals who are laser-focused on building the company’s smart logistics network of the future. Read his thoughts below on how innovation and sustainability became part of the UPS DNA. Longitudes: How is advanced technology changing how UPS views its own business? Perez: The nature of our work gives us a view across practically all industries, most of which are undergoing massive disruption spurred by technology. Many of them are transforming to create entirely new ways of serving existing needs. We’re changing too: updating our technology, developing new solutions and integrating our systems with our customers’ systems to give them newfound flexibility and capabilities. In the process, we’re using technology to disrupt our own industry. In a way, advancements that drive business performance and enhance customer experience have transformed UPS from a logistics and transportation company to a technology company capable of supporting the most complex supply chains. Longitudes: How is the UPS Advanced Technology Group (ATG) addressing these trends? Perez: UPS formed the ATG in 2017 with a single purpose: to bring the global smart logistics network to life. The smart logistics network will deliver UPS’s sustainable future growth by connecting our shippers and receivers through new, data-driven capabilities for distribution, sorting and transportation and delivery. We’re researching, testing and developing new technologies that will transform UPS’s operations and allow us to offer faster, more flexible services for our customers. The smart logistics network improves visibility and efficiency and uses data and analytics to improve decision making. UPS was already exploring many of these technologies, but our ATG is allowing us to iterate and move more quickly. It is also helping us strengthen collaboration with technology companies and academic institutions to explore innovative solutions. Longitudes: Are investments primarily supporting operational improvements or new customer services? Perez: Both are priorities for our investments. We call our approach the Innovation Cycle. As we build technology to support operational improvements, that same technology helps us create new services and capabilities. For example, package flow technology, which was initially an operational innovation, helped us develop new solutions such as UPS My Choice® and UPS Access Point™ that give customers control over when and where their packages will be delivered – even when items are already in transit. Longitudes: How is the growth of e-commerce shaping UPS’s technology investments? Perez: In 2017, UPS delivered more than 762 million packages during our holiday peak season, materially above the previous year and over plan and market estimates. That reality inherently changes what kind of network we need to have and how efficiently we must run to remain competitive. It’s challenging us to explore concepts that improve package density by implementing tools and strategies to make deliveries and pickups more efficient through consolidating shipments based on geographic proximity. Sophisticated algorithms enable us to align packages, delivery commitments and geographies in real time so we can optimize our network and routes. As a result, we can do more with the same amount of energy, which is better for our customers – and the environment. Longitudes: What’s next for innovation at UPS? Perez: We are just starting to see the opportunities that technology can provide. We are working on a next generation of the On-Road Integrated Optimization and Navigation (ORION) system, which will help us further improve efficiency and reduce miles by optimizing routes dynamically as drivers complete their work. This technology is able to make adjustments to delivery routes based on real-time information about traffic congestion, road conditions or requests for new package pickups. We are expanding our mobile technology solutions and using artificial intelligence and advanced analytics to improve our network through the Network Planning Tools. Today, technology can be a rapid game changer in how packages are delivered to challenging environments. Just look at what’s already happening in Rwanda, where we’ve partnered with a drone operator and a global health organization to streamline the supply of vaccines and critical medications to remote and hard-to-reach areas. From increased mobile solutions for our customers and our own operations to deploying machine learning, artificial intelligence and virtual reality, UPS is applying technology-centric solutions to almost every aspect of our business. 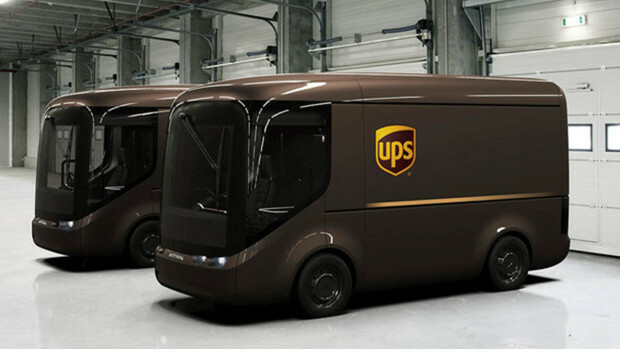 Top photo: UPS is working with UK-based technology firm ARRIVAL to develop a state-of-the-art pilot fleet of 35 electric delivery vehicles (EVs) to be trialed in London and Paris. These zero tailpipe emission, lightweight composite vehicles have a battery range of more than 150 miles (240 kilometers), which is significantly higher than other EVs currently in service. Click here to learn more.